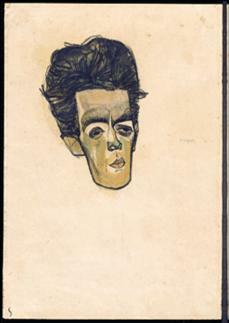 The Morgan Library claims that the Berne gallery Gutekunst & Klipstein purchased this artwork directly from the estate of Egon Schiele. Source: From Berlin to Broadway: The Ebb Bequest of Modern German and Austrian Drawings (2007). Gutekunst & Klipstein (now owned by Eberhard Kornfeld) claims that the work belonged to Fritz Grunbaum and that it bought the work in 1956 through Grunbaum’s sister in law. Why would the Morgan Library tell a different story? We know that the Nazis have carried off virtually all of the movable works of art in private possession. The methods by which these properties are acquired have an ingenious quality of wickedness bordering on the naïve. The Nazis resort to the strictest legal fictions to justify their operations. …The laws regarding ownership of property by Jews have been invoked at every turn…. They were easy victims. … their personal possessions — particularly works of art — were sold at public auction where German officials directly, or indirectly through local Quislings, bought in the objects with the worthless paper currency … . Then in turn the money realized by the original owner was taxed 100 percent and passed directly to the Nazi treasury. Not since the time of Napoleon Bonaparte has there been the wholesale looting and destruction of art property that is going on today in the occupied countries. The Nazis have either confiscated or acquired by fictitious purchase the most important masterpieces of both public and private collections. …after a fugitive existence [the artworks] will inevitably find their way to the free markets of neutral countries. In Buenos Aires and Madrid, in Stockholm, Berne and Lisbon, in Istanbul and Cairo we will see come out of hiding in the years immediately following the war objects of great intrinsic worth, held for the most part under fictitious names, and representing the real assets of the Nazi officials who are lucky enough to escape. These works will be offered primarily in the Western Hemisphere. How can we prevent this from happening and becoming ourselves party to the looting of Europe? Private individuals might continue to operate in a “black market” of antiquities in which no questions would be asked, but public institutions disposing of trust funds could not very well connive in the liquidation of the artistic patrimony of Europe and act as public receivers of stolen goods. Why is it that only today’s American museum directors seem to believe that Jews voluntarily sold artworks under the Nazi reign of terror? And that they have a fiduciary duty to conceal stolen property? Francis Henry Taylor knew that people in Berne would be selling artworks using fake names and he warned the art market. In 1943.